Temperature control can help save on heating and cooling costs. 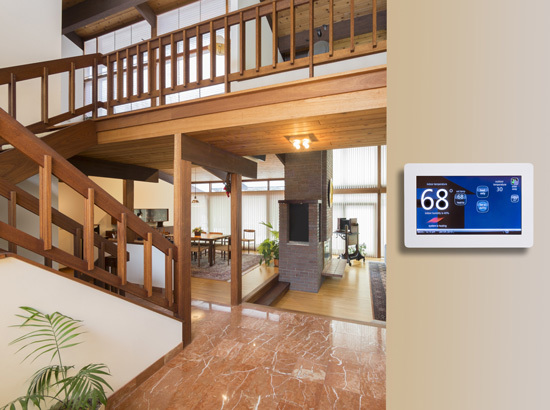 Enhance your space by adding a smart thermostat that can learn your heating and cooling needs and adapt the space for your comfort. Imagine being able to walk out of your house knowing your thermostat is doing all the work and keeping your energy consumption low, and coming back to the house with a perfectly heated or cooled home. All while reducing your carbon footprint. Integrate a smart thermostat with any one of our automation systems along with your existing HVAC, radiant flooring, forced air, dual fuel and geothermal systems. Adjust climate settings at the thermostat or through the user-interface from a touchscreen or smartphone. Allow temperature and humidity to adjust according to the season. Enjoy personalized comfort settings that can be activated on a schedule, with just a few taps on your phone or touch screen, or by voice. If you like total control, then use your phone to set your desired temperature before you get home. You will never have to walk into a cold home again.